Will tight capacity in European road transport conspire to push rates to new highs? Demand for road freight capacity on European roads is on the up. On average, in the first quarter of 2018, the freight to vehicle ratio was 54:46, according to the TimoCom Transport Barometer. For comparison, the average freight to vehicle ratio in the first quarter of 2017 was 43:57. This means that there is an ever-growing number of goods that need to be transported from A to B which have fewer and fewer trucks available to transport them. The development corresponds with the fast-growing economy in Europe. The GDP of the Eurozone expanded by 2.5% in 2017, signalling the most rapid rate of growth in a decade, according to Eurostat. This cyclical expansion across the continent is spurring road freight activity, resulting in scarce vehicle capacity. Overall, capacity has been below average since Q2 2017. In addition to the expansion of the Euro economy, existing structural problems inherent in the industry, such as driver shortages, might have also contributed to the capacity crunch. The UK is among several European countries experiencing major driver shortage issues. With a shortage of 55,000 drivers that risks almost doubling due to uncertain status of about 43,000 EU drivers following Brexit, the UK industry faces the biggest problem. Some logistics companies have already introduced initiatives to remedy the driver shortage. For instance, Clipper Logistics has launched a new initiative to train its warehouse employees as drivers and STEF is offering generous bonuses and opportunities to acquire shares in the French company in a bid to attract drivers from rival firms. Despite these individual initiatives, the driver shortages problem cannot be resolved in the short term and could develop into a lasting trend. 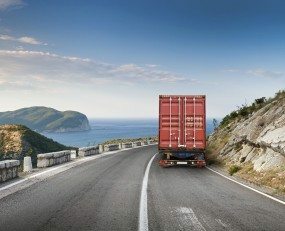 With driver shortages continuing to cause headaches for road freight operators, coupled with the record capacity crunch and strong demand in European road freight, one would expect road freight rates to reach new highs. This trend of rising road freight rates is already evident. As can be seen on Ti Dashboard which measures the Eurostat’s road freight transport price index, the EU has seen a slight but steady rise in the road freight price index since Q1 2017. With no end in sight for the high demand for road freight capacity, the new developments have created a completely new situation for European road freight operators. If they previously had to operate with slim profit margins, today they can take advantage of the capacity crunch and choose the route that works best for them.